Echo Park third baseman Guillermo Coss was sensational. He was 4-5 with a home run, a triple, and 2 singles. He scored 2 runs, but it wasn't enough to rally his team to a win. Houston beat the Lakers, 7-6. Coss was named the player of the game despite the loss. Houston reliever Pedro Valdéz picked up the win, bumping his record to 1-0. Jeffery Prosser was collared with the loss. The 1837 BBC, now 14-7, have been playing some good baseball. Phil Sherman took Jeffery Prosser deep in the bottom of the ninth. His 2-run home run put the 1837 BBC on top, 7-6. 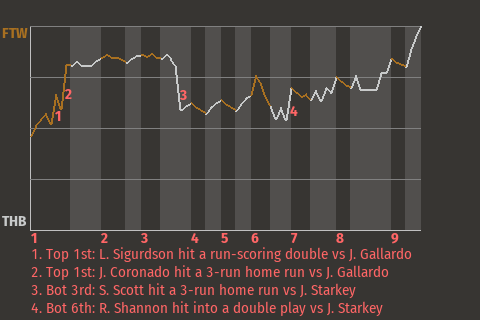 In all, Sherman had 1 single in addition to the home run, while going 2 for 4. "We found a way to get it done," Sherman said.